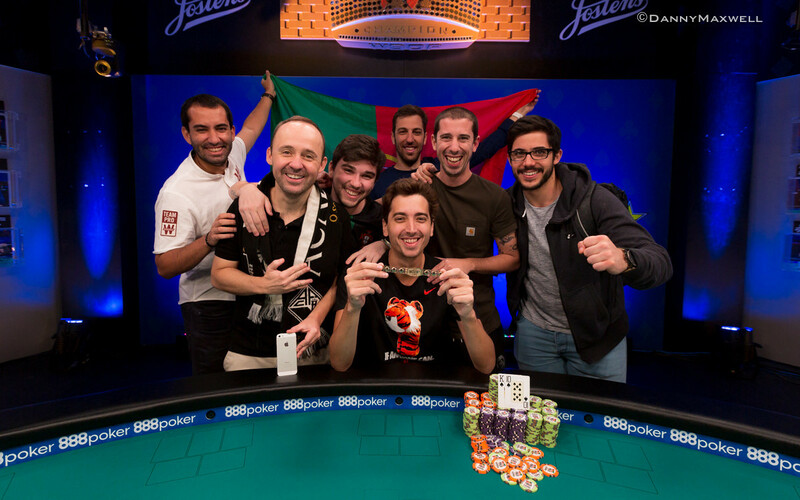 A whole lot of chanting in Portuguese could be heard coming from the Twitch stream table in Brasilia this afternoon as Diogo Veiga became the first Portuguese player to lift WSOP gold in Las Vegas for the country's third bracelet overall. "Yesterday we had the Bulgarian rail as well, so there was kind of a match between the rails and it was pretty intense," said Veiga. "Today the Portuguese rail won. They are a big part of my win and I'm really happy." Veiga's second-largest career cash of $522,715 that came with the bracelet for winning Event #54: Big Blind Antes $3,000 No-Limit Hold'em followed his largest cash worth about US$555,000 by less than three months. That one came for a sixth-place finish in the partypoker MILLIONS Grand Final Barcelona €10,300 Main Event in April. In his winner interview, Veiga mentioned that he learned from that deep run in Spain and was happy to better the finish in this one. Until April, Veiga had not a single score in the six-figure range, and didn't even have a score that exceeded $40,000, making 2018 his breakout year in a big way. He hopes to carry the momentum from the first half of the year right into the rest of it. "Perhaps now I'll see what more there is I can play," he said. "The strategy won't change. I had 15 tough days before, but now, this is a turning point. I'm going to play the Main Event and just see what happens. It's still going to be a great summer." Diogo Veiga had the boisterous support of his Portuguese rail. The $3,000 buy-in Big Blind Antes event drew 1,020 players who battled for a chunk of the $2,754,000 prize pool. A total of 252 players survived the first day of play, and the money was reached on Day 2 when they got down to 153 players, the minimum payout worth $4,513. 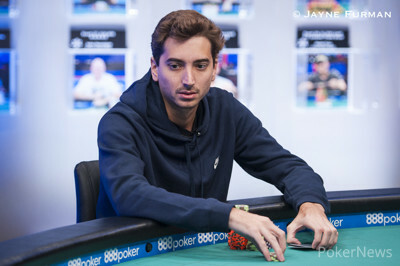 Jonathan Abdellatif led the final 31 players into Day 3, and bracelet winner Barry Hutter took over the lead just after play got down to two tables. Bulgaria's Radoslav Stoyanov then grabbed the lead from Hutter after he eliminated two-time bracelet winner Kristen Bicknell in 11th place to set up the unofficial final table. Both Radoslav and Hutter took big stacks into the final table, as did David Yan. Anna Antimony sent Ryan Hall out in tenth, picking up pocket tens against Hall's shove with pocket deuces, to get down to the official final table. 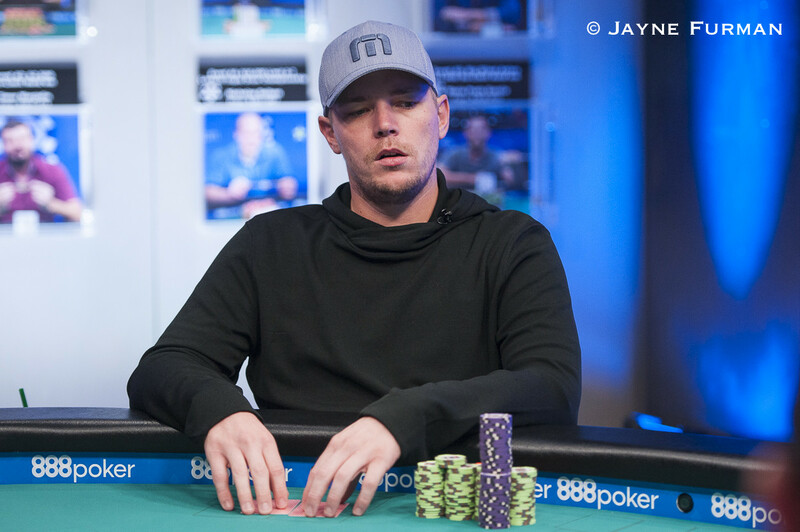 Todd Ivens was out next in ninth place when he turned aces-up with ace-seven but trailed Abdellatif's flopped set of eights and hit the rail. Ireland's Cathal Shine was eliminated in eight place, shoving his ace-jack from the small blind into the ace-queen suited of Hutter in the big blind, which would be a theme for Hutter at this final table. Neither player made a pair and Hutter's ace-queen high pipped Shine, who had to settle for $49,126. Antimony entered the final table as one of the shorter stacks, and despite getting a double up against Hutter, her kings against his ace-jack, she would eventually fall in seventh place when she shoved her queen-jack from the cutoff and Hutter looked her up with ace-seven in the big blind. Despite flopping a pair of queens and a gut-shot, Hutter spiked an ace on the turn and held. After doubling up several opponents at the final table, Yan dwindled to under ten big blinds and shoved with jack-six in the small blind. He ran into the jack-nine of Abdellatif, who called in the big blind and rivered nines-full to end Yan's run in sixth place. Despite doubling up with ace-queen through Abdellatif's ace-three, long-time WSOP regular Tom McCormick would eventually be the fifth-place finisher when he four-bet shoved pocket jacks from the big blind and got called by Veiga, who had three-bet Abdellatif's open-raise with ace-four suited. Veiga found an ace on the flop to send McCormick out with a six-figure score and his 72nd summer WSOP cash, still without a win. The remaining four players finished out the level before bagging up, Hutter with the lead and Veiga not far behind. Event #54: Big Blind Antes $3,000 No-Limit Hold'em final four players. With the support of his friends on the rail, who alternated between chants of "Campeão" and "Buffalo!" Veiga stood by while Hutter knocked out the third- and fourth-place finishers to get heads-up. In the ninth hand of the final day, the short stack upon entering the day, Abdellatif, shoved his remaining nine big blinds from the small blind with ten-five. Unfortunately for him, Hutter called from the big blind with a dominating queen-ten, and he couldn't find help from the board. Abdellatif was out in fourth place, taking home a $163,404 payday for his efforts. Stoyanov suffered a similar fate as Abdellatif, shoving from the small blind when folded to him with nine-four suited. Once again, Hutter was in the big blind and called with a superior hand, king-queen this time, which held up on the ace-high and pair of tens runout. Veiga had his work cut out for him and had to climb back from a more than 3-2 deficit in chips against Hutter heads up. After slipping a bit, he found a double up, flopping the nut straight on the flop with six-three. The chips went in and Veiga had to fade Hutter's flush draw and gut-shot for a higher straight, which he did. From there, the two battled back and forth, and eventually Veiga climbed into a comfortable lead. Though Hutter started making a comeback, Veiga grinded him down again and then raise-called Hutter's 18-big blind shove with , needing help against . He found that help on the flop, prompting an eruption of cheers from the Portuguese rail. The turn provided a sweat, giving Hutter outs for a flush, but the river was safe for Veiga. Hutter's bid for bracelet number two ended with his 22nd WSOP cash, a runner-up finish for his best live cash worth $323,019. With the score, Hutter's WSOP earnings are closing in on $1 million, while his overall tournament winnings sit above $4.35 million, according to Hendon Mob. Barry Hutter finished runner-up in Event #54 for his best live cash of $323,019. Veiga credited his rail for the king on the flop that locked up his bracelet win. "[The rail] called for that king on the flop way more than me!" said Veiga. "The last hand is definitely on them... The other ones are on me!" Veiga was beside himself after the win, his compatriots standing by, still hyping him up. "It feels amazing. I can't believe it yet," said Veiga. "The adrenalin is still too high. I can't say much more than that, I'm just super happy." That concludes coverage of Event #54, but there's still more poker to be played at the 2018 World Series of Poker. You can follow the live updates for all remaining events right here at PokerNews. Barry Hutter Eliminated in Second Place ($323,019); Diogo Veiga Wins Event #54 ($522,715)! Hand #271: Diogo Veiga limped the button and Barry Hutter moved all in for 3.66 million. Veiga asked for a count and sat back in his chair. He took several seconds and announced a call. He was less than pleased to see that his was up against the of the all-in Hutter. After a long production delay, the dealer spread the flop and the Portuguese rail errupted. The turn provided Hutter with flush outs, and his eyes were fixed on the monitor. The meaningless fell on the river and victory was sealed for Veiga, who ran to his rail and jumped around with them, everyone shouting in Portuguese. For his runner-up finish, Hutter takes home $323,019, while Veiga wins his first bracelet for $522,715. Hand #266: Barry Hutter limped and Diogo Veiga raised to 700,000. Hutter called and the flop came . Veiga checked and Hutter bet 700,000. Veiga folded. Hand #267: Veiga limped and Hutter checked. The pair checked a board and the river was the . Hutter check-folded to a bet of 300,000. Hand #268: Hutter raised to 600,000 and Veiga called. The flop came and both players checked. The turn was the . Veiga bet 800,000 and Hutter folded. Hand #269: Veiga raised to 500,000 and Hutter raised to 1,700,000. Veiga moved all in and Hutter folded. Hand #270: Hutter raised to 600,000 and took down the pot. Hand #261: Diogo Veiga limped on the button and Barry Hutter raised to 800,000. Veiga let it go and Hutter took the pot. Hand #262: Hutter limped the button and Veiga checked. They took a flop of and Veiga check-called Hutter's bet of 200,000. The turn brought the and Veiga checked again. Hutter bet 400,000 this time and Veiga let it go. Hand #263: Veiga limped the button and Hutter made it 800,000. Veiga folded and Hutter won yet another. Hand #264: Hutter made it 600,000 on the button and Veiga called. They saw a flop of and both players checked. On the turn, Veiga checked, Hutter bet 600,000 and Veiga let it go. Hand #265: Veiga limped the button and Hutter checked. The flop was and Hutter check-called Veiga's 200,000 bet. On the turn, Hutter checked again. Veiga bet 600,000 and Hutter called. The river brought the . It checked through and Hutter tabled seven-three for a pair of sevens, but Veiga's ace-nine won him the pot. Hand #256: Barry Hutter received a walk. Hand #257: Hutter raised to 600,000 and took down the pot. 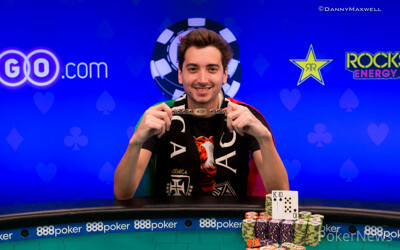 Hand #258: Diogo Veiga raised to 500,000 and took down the pot. Hand #259: Hutter limped and Veiga checked. The flop came and Veiga check-called a bet of 200,000. The turn was the . Both players checked and the river was the . Veiga checked and Hutter bet 700,000. Veiga called and was shown from Hutter for two pair and took down the pot. Hand #260: Veiga limped but folded when Hutter raised to 800,000. Hand #251: Barry Hutter completed on the button and Diogo Veiga made it 700,000. Hutter folded and Veiga took the pot. Hand #252: Veiga limped and Hutter checked. On the flop, Hutter check-called 200,000 from Veiga. The turn was the and Hutter checked. Veiga bet 500,000 and Hutter called. The river was the . Both players checked and Hutter tabled . Veiga's for a pair of eights with a better kicker was good though. Hand #253: Hutter limped the button and Veiga checked. Both players checked the flop and the turn was the . Veiga checked, Hutter bet 250,000 and Veiga called. On the river, both players checked and Veiga tabled for a pair of sixes, good for the pot. Hand #254: Veiga completed on the button and Hutter checked. Both players checked the flop and the turn brought the . Both players checked again to see the river and Hutter led 300,000. Hutter's was no good as Veiga showed for a better two pair. Hand #255: Hutter limped the button and Veiga shoved. Hutter let it go and Veiga took the pot. The two remaining players are taking their first 15-minute break of the day. Hand #245: Barry Hutter limped and Diogo Veiga checked his option. The flop was checked by both players. The turn was the . Veiga bet 300,000 and Hutter folded. Hand #246: Veiga limped and Hutter checked his option. The whole board of was checked down. Hutter showed and Veiga won with . Hand #247: Hutter raised to 400,000 and Veiga called. Veiga checked the flop and Hutter bet 400,000. Veiga raised to 950,000 and Hutter folded. Hand #248: Veiga limped and Hutter checked. Hutter checked the flop and Veiga checked behind. The turn brought the , pairing the board. Hutter checked again and Veiga bet 200,000. Hutter called and the river was the . Both players checked and Hutter won with . Hand #249: Hutter limped and Veiga checked. The flop was and Veiga checked. Hutter bet 200,000 and took down the pot. Hand #250: Veiga limped and Hutter raised to 500,000. Veiga called and the pair saw a flop. Hutter bet 500,000 and Veiga folded. Hand #240: Barry Hutter got a walk in the big blind. Hand #241: Hutter raised to 400,000 on the button and Diogo Veiga defended. On the flop, both players checked and saw the on the turn. Veiga checked, Hutter bet 500,000 and Veiga let it go. Hand #242: Hutter got another walk. Hand #243: Hutter limped the button and Veiga raised to 450,000. Hutter called and they took a flop of and both players checked. The turn was the and they checked again. On the river, Veiga bet 550,000 and Hutter let it go. Hand #244: Veiga raised to 350,000 on the button and Hutter defended. The flop came and Hutter checked. Veiga continued for 375,000 and Hutter called. On the turn, Hutter checked again to Veiga, who bet 1.05 million and Hutter folded. 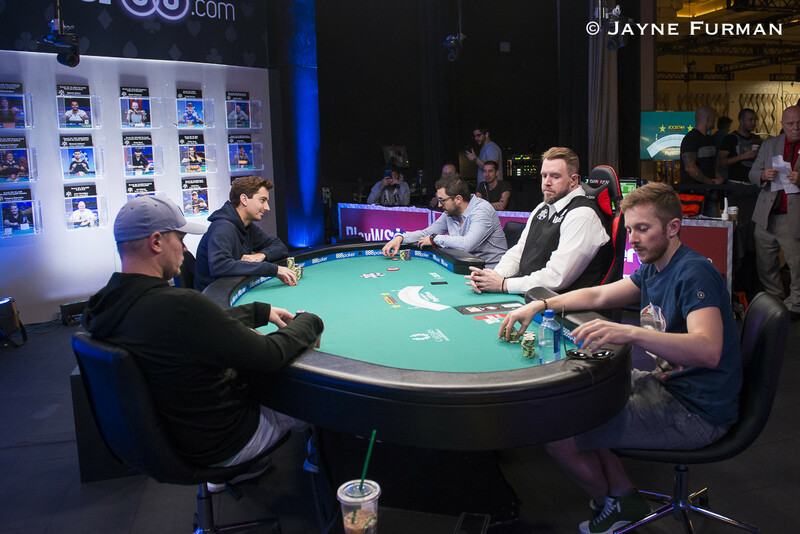 Hand #235: Barry Hutter raised to 400,000 and took down the pot. 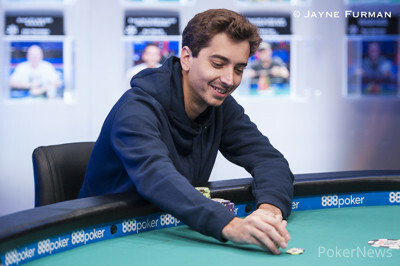 Hand #236: Diogo Veiga limped and Hutter raised to 500,000. Veiga called and the flop came . Both players checked and the turn brought the . Hutter check-called a bet of 550,000 and the river was the . Both players checked and Hutter took down the pot with . Hand #237: Hutter limped and Veiga checked. The flop came and Veiga checked and Hutter bet 200,000. Veiga raised to 550,000 and Hutter called. The turn was the . Veiga bet 900,000 and Hutter called. The river was the . Veiga checked and Hutter checked behind. Veiga showed for trip queens and took down the pot. Hand #238: Veiga raised to 350,000 and Hutter called. The flop came and Hutter check-folded to a bet of 350,000. Hand #239: Hutter limped and Veiga checked. The flop was and Veiga checked. Hutter bet 200,000 and Veiga raised to 650,000. Hutter folded. Hand #230: Barry Hutter got a walk in the big blind. Hand #231: Hutter limped the button and Diogo Veiga checked his option. They both checked the flop and the came on the turn. Veiga bet 275,000 and Hutter called. The river was the and Veiga led 1,075,000. Hutter sent his hand to the muck and Veiga took the pot. Hand #232: Veiga limped the button and Hutter checked. On the flop, Hutter check-folded to Veiga's 200,000 bet. Hand #233: Hutter opened to 400,000 on the button and Veiga defended. The flop came and Veiga checked. Hutter bet another 400,000. Veiga called and they saw the on the turn. Both players checked and the came on the river. Both players checked and Veiga tabled for the flopped nut flush to win the pot. Hand #234: Veiga completed on the button and Hutter checked. The flop was and Hutter checked. Veiga bet 200,000 and Hutter called. On the turn, Hutter checked again and Veiga bet 650,000. Hutter let it go and Veiga took another pot. Hand #224: Diogo Veiga limped and Barry Hutter raised to 500,000. Veiga folded. Hand #225: Hutter limped and Veiga checked. The flop came . Veiga check-called a bet of 200,000 and the turn was the . Both players checked and the river was the . Veiga checked and Hutter bet 350,000 and Veiga folded. Hand #226: Veiga limped and Hutter checked. The flop came and Hutter check-folded to a 160,000 bet from Veiga. Hand #227: Hutter limped and Veiga raised to 450,000. Hutter called. The flop came . Veiga bet 375,000 and took down the pot. Hand #228: Veiga raised to 350,000 and Hutter called. The flop came and it checked to Veiga who bet 300,000. Hutter called and the turn was the . Hutter again checked and Veiga bet 750,000. Hutter called. The river was the . Both players checked. Hutter showed and Veiga took down the pot with . Hand #229: Hutter limped and Veiga checked. The flop came and Veiga check-folded to a bet of 200,000. Hand #219: Barry Hutter limped the button and Diogo Veiga called. The flop was and Veiga check-called Hutter's bet of 225,000. Both players checked the turn and the river was the . Veiga checked, Hutter bet 350,000 and Veiga let it go, the pot going to Hutter. Hand #220: Veiga limped the button and Hutter checked his option. The flop brought and Hutter led 225,000. Veiga raised to 550,000 and Hutter moved all in. Veiga called for his remaining 1.46 million and the cards were on their backs. Veiga had the nut straight, but Hutter had spade outs, or a six to give him a higher straight. The turn and the river secured the double up for Veiga and the match goes on. Hand #221: Hutter limped the button and Veiga made it 450,000. Hutter shoved to put Veiga to a decision for the rest and Veiga thought it over before folding. Hand #222: Veiga limped the button and Hutter checked. The flop brought and Hutter checked. Veiga bet 160,000 and Hutter called. The turn and the river were checked through and Hutter tabled . Veiga tabled for a better pair to drag the pot. Hand #223: Hutter opened to 400,000 on the button and Veiga let it go. Hand #216: Diogo Veiga raised to 300,000 and took down the pot. 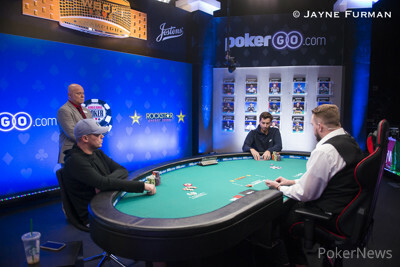 Hand #217: Barry Hutter raised to 300,000 and Veiga three-bet to 1,020,000. Hutter called. The flop came Veiga continued for 725,000 and Hutter called. The turn was the . This time both players checked. The river was the . Veiga checked and Hutter bet 1,280,000. Veiga thought for a couple of minutes before calling. Hutter showed for top pair, and Veiga shook his head as he mucked. Hand #218: Veiga limped in the small blind and Hutter raised to 400,000. Veiga folded. Hand #211: Barry Hutter raised to 300,000 on the button and Diogo Veiga folded, and the pot went to Hutter. Hand #212: Veiga raised to 300,000 on the button and Hutter defended. The flop came and it checked through. The turn checked through too, and the river was the . Hutter checked, Veiga bet 335,000 and Hutter let it go. 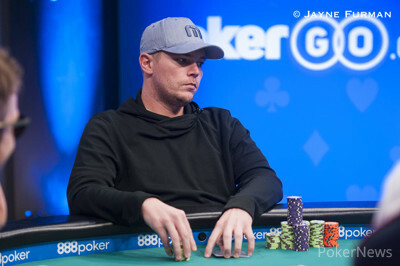 Hand #213: Hutter raised to 300,000 and Veiga defended. Both players checked the flop and the paired the board on the turn. They checked again to see the on the river, and Veiga led 300,000. Hutter quickly called and Veiga announced his hand. Hutter tabled for aces and kings, good for the pot. Hand #214: Veiga raised to 300,000 on the button and Hutter defended. The flop was and both players checked. The turn brought the and they checked again. On the river, Hutter bet 350,000 and Veiga let it go. Hand #215: Hutter opened to 300,000 on the button and Veiga defended. The flop came and Veiga checked to Hutter, who continued for 300,000. Veiga called. The turn brought the and Veiga led 650,000. Hutter folded and Veiga took it down. Hand #210: Radoslav Stoyanov moved all in for 835,000 from the small blind and Barry Hutter called in the big blind. The flop came giving Stoyanov a gutshot. The turn was the . 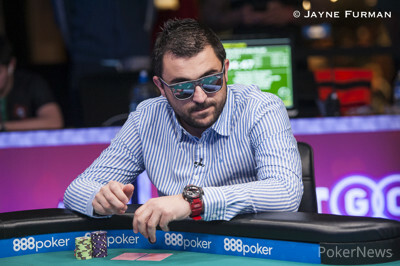 The river was the and Stoyanov was eliminated in third place for $228,241. Hand #206: Diogo Veiga limped in the small blind and Radoslav Stoyanov checked. The flop came . Veiga bet 130,000 and Stoyanov folded. Hand #207: Veiga raised to 250,000 and took down the pot. Hand #208: Barry Hutter limped in the small blind and Veiga checked his big blind. The flop came and both players checked. The turn was the and Hutter bet 250,000. Veiga called and the river was the . Hutter bet 550,000 and Veiga folded. Hand #209: Veiga limped in the small blind and Stoyanov checked. Both players checked a board of and the river was the . Veiga bet 125,000 and Stoyanov called. Veiga showed and took down the pot.